The H-2B temporary foreign worker program: For labor shortages or cheap, temporary labor? The Essential Worker Immigration Coalition (EWIC)—a lobbying group representing the interests of employers—claims that it is “concerned with the shortage of both semi-skilled and unskilled (‘essential worker’) labor” and thus “supports policies that facilitate the employment of essential workers by U.S. companies that are unable to find American workers.” Representatives of other influential corporate lobbying groups, including the U.S. Chamber of Commerce and ImmigrationWorks USA, have made similar claims. These groups are advocating to deregulate and expand the H-2B temporary foreign worker program, which permits U.S. employers to temporarily hire workers from abroad with H-2B nonimmigrant visas for lower- and semi-skilled occupations that are non-agricultural and seasonal in nature. And, claiming that “many American businesses could not function without the H-2B program” the Chamber and ImmigrationWorks USA want Congress to create a new and much larger program that would permit them to hire lower- and semiskilled guestworkers for year-round jobs. While Congress debates whether to expand existing temporary foreign worker programs and whether to create a larger new program, it should note the lack of credible evidence that there are labor shortages in lesser-skilled jobs. This report does not attempt to establish whether labor shortages exist in H-2B occupations, but instead looks at employment growth, wages, and unemployment rates in the main occupations of H-2B workers. Following are the main findings of the report. 1. Despite above-average employment growth in some of the top H-2B occupations, the fact that wages have been stagnant or declining, combined with persistently high unemployment rates, suggests that there are no labor shortages at the national level in the top H-2B occupations. There was no significant wage growth; in fact, wages were stagnant or declining for workers in all of the top 15 H-2B occupations. Seven of the top 15 occupations experienced employment growth that exceeded the overall growth of 5.5 percent for all occupations, two experienced employment growth that was less than the overall growth for all occupations, and six contracted. In the three fastest-growing occupations of Nonfarm Animal Caretakers (up 99.5 percent), Coaches and Scouts (up 72.3 percent), and Cooks in Restaurants (up 44.3 percent), wages declined over the same ten-year period. Unemployment rates increased in all but one of the top 15 H-2B occupations, and all 15 occupations had very high average unemployment rates in 2013–2014 (the most recent data available). In 11 of the top 15 H-2B occupations, unemployment dropped from 2004–2005 to 2006–2007, but then rose significantly between 2006–2007 and 2013–2014. Such high unemployment rates suggest a loose labor market in the top 15 H-2B occupations. 2. While a change in prevailing wage rules in the middle of 2013 (known as the 2013 Interim Final Rule or IFR) may have helped fuel a slight increase in the wages that H-2B jobs were certified at by the U.S. Department of Labor, H-2B wage rules continue to allow hourly wage rates that are far lower than state and national averages in the overwhelming majority of cases. Except for six instances out of 45, nationwide, on average, H-2Bs were certified at a wage that was below the national OES average wage. In the top H-2B occupation, of Landscaping and Groundskeeping Workers, employers saved on average between $2.59 and $3.37 per hour by hiring an H-2B worker instead of a worker earning the national average wage for the occupation. In the second-largest H-2B occupation, Forest and Conservation Workers, employers saved on average between $3.27 and $3.80 per hour by hiring an H-2B worker instead of a worker earning the national average wage for the occupation. Comparing the average hourly certified H-2B wage for an occupation in a particular state with the average hourly wage for the occupation in the state yields similar results, with the share of all top 15 H-2B certifications that were in occupations where the average certified H-2B wage exceeded the state OES average rising but still low: from 1.2 percent in fiscal 2012 to 3.5 percent in fiscal 2013, to 9 percent in fiscal 2014. 3. Soon after the 2013 Interim Final Rule came into effect, H-2B employers shifted en masse to the use of private wage surveys—and evidence revealed in federal litigation clearly suggests that the shift to the use of private wage surveys was a systematic response by H-2B employers to keep H-2B wages lower than the average OES wage rate that would otherwise be required under the 2013 Interim Final Rule. Specifically, in the nine months between July 1, 2013, and March 31, 2014, employers increased their submissions of private wage surveys for H-2B prevailing wage determinations by 3,182 percent, as compared with the 12 months leading up to the federal court decision that invalidated the previous H-2B wage rule. In 21.1 percent of those determinations, the certified H-2B wage was lower than the Level 1 H-2B prevailing wage, which is the 17th percentile wage by occupation and local area (according to U.S. Department of Labor OES wage survey data), and 94.4 percent of the determinations were for a wage that was lower than the Level 2 (34th percentile) wage (whereas the Level 3 wage is generally considered the local average wage, or roughly the 50th percentile wage). The Essential Worker Immigration Coalition (EWIC)—a lobbying group representing the interests of employers—claims that it is “concerned with the shortage of both semiskilled and unskilled (“essential worker”) labor” and thus “supports policies that facilitate the employment of essential workers by U.S. companies that are unable to find American workers” (EWIC 2015). Representatives of other influential corporate lobbying groups, including the U.S. Chamber of Commerce and ImmigrationWorks USA, have made similar claims. The main policy solution these groups advocate is the deregulation and expansion of the H-2B temporary foreign worker program (also often referred to as a “guestworker” program), which permits U.S. employers to temporarily hire workers from abroad with H-2B nonimmigrant visas for lower- and semi-skilled occupations that are non-agricultural and seasonal in nature. A second policy response advocated by the U.S. Chamber, ImmigrationWorks USA, and EWIC is the creation of a new and much larger temporary foreign worker program to fill year-round jobs in lower- and semi-skilled non-agricultural occupations. Unlike in the H-2B program, temporary foreign workers employed in the United States under the EWIC plan would be allowed to work year round instead of only seasonally, as well as to switch to another job with a different employer under an employer registration protocol. Guestworkers in this program also would eventually be allowed to apply for permanent residence if they met certain requirements. Under the EWIC plan, the new temporary foreign worker program would have an annual numerical limit that starts “at 400,000 a year to keep up with demand” (EWIC 2007). On more than one occasion, a program resembling the EWIC proposal has been seriously considered by Congress. In May 2005, a bill authored by Senators Edward Kennedy and John McCain that would have comprehensively reformed the U.S. immigration system, included provisions that would have created a new temporary foreign worker program with an initial annual limit of 400,000 that could be adjusted upward after the first year in response to employer demand.2 More recently, in the context of spring 2013 Senate negotiations to craft comprehensive immigration reform legislation, representatives of the U.S. Chamber and the AFL-CIO (the nation’s largest trade union federation) agreed to a legislative proposal to create a new, year-round temporary foreign worker program for non-agricultural lower-skilled occupations (Parker and Greenhouse 2013).3 The agreed-upon framework became part of the Border Security, Economic Opportunity, and Immigration Modernization Act (also known by its bill number, S. 744), which passed the Senate on June 27, 2013, by a vote of 68 to 32 (Silverleib 2013). If S. 744 had become law, a new temporary foreign worker program known as the “W-1” visa program would have eventually permitted employers to hire a maximum of 200,000 additional guestworkers per year. While Congress continues to debate whether to expand existing temporary foreign worker programs and whether to create a much larger new program for employers who claim there are labor shortages in lower- and semi-skilled occupations, there is no credible evidence that such labor shortages exist. In fact, little has been written regarding the current state of the most common H-2B occupations, in terms of employment levels, wages, and unemployment rates. Other than employer anecdotes, no credible data or labor market metrics have been presented by non-employer-affiliated groups or organizations—let alone by disinterested academics—proving the existence of labor shortages that could justify a large expansion of non-agricultural lower- and semi-skilled temporary foreign worker programs. This report collects and assesses the available evidence on employment, wages, and unemployment rates in the top 15 certified H-2B occupations in fiscal 2014, for the 2004–2014 period. This report does not, however, attempt to conduct a detailed national, regional, or local labor shortage analysis or make a determination about the existence of shortages in particular H-2B occupations. This report reviews the average wages certified nationwide in the top 15 H-2B occupations in fiscal years 2012, 2013, and 2014, and compares them with the average wages nationwide for each occupation and with the average wage in each state where an H-2B job was certified. The report also explains the different prevailing wage rules in place during the different fiscal years, and explores how they may have affected the results. Specifically, the report calculates the difference between the H-2B wage certified by the U.S. Department of Labor and the average national or state wage, and this gap in most cases represents how much employers can save on their wage bill, on average, by hiring an H-2B worker instead of a U.S. worker earning the local average wage for the occupation. The impact of employer-submitted private wage surveys (i.e., wage surveys that were not conducted by the U.S. Department of Labor) on determining H-2B prevailing wages is also assessed. In the available H-2B data, requests for labor certification from employers are either labeled as certified, partially certified (meaning some fraction of the total number of the workers requested is certified, while the rest are denied), or denied (entirely) by DOL. Some records in the data may also be labeled as “certification expired” or “partial certification expired” (however not every year of DOL data on H-2B includes records labeled as certification expired or partial certification expired). H-2B labor requests that are certified may then be sent by employers to the United States Citizenship and Immigration Services (USCIS), which is part of the Department of Homeland Security (DHS), for review. USCIS may approve or deny the H-2B petition submitted by the employer. H-2B petitions that are approved by USCIS are then forwarded to the U.S. Department of State (DOS), which determines whether or not to issue an H-2B visa to an individual foreign worker after a consular interview, unless the H-2B worker is already in the United States in another immigration status (in that case, USCIS can adjust the worker’s status to H-2B). These requests populate the DOL database, which is able to provide data on the pledged wages attached to each request for labor certification—the hourly wage rates contained in the requests that were certified but not yet approved by USCIS are referred to in this report as the certified H-2B wage. It is important to note that the number of certified H-2B labor requests is not the same as the final number of H-2B visas issued in a fiscal year (which are tallied by DOS) (Bureau of Consular Affairs 2015) or the number of H-2B “admissions,” i.e., persons crossing through a port of entry into the United States with a valid H-2B visa (which are tallied by DHS) (Monger 2013). Because some of the requests for labor that DOL certifies do not result in an H-2B visa for a worker, the number of labor certifications is always higher than the number of petitions approved by USCIS and the eventual number of visas issued by DOS. For example, in fiscal 2013, DOL certified 82,307 requests for H-2B workers, of those USCIS approved 79,219 workers, and DOS issued 57,600 H-2B visas. (U.S. law also specifies that the number of H-2B visas issued in a fiscal year may not exceed 66,0005—this is commonly referred to as the annual H-2B “cap”—however certain exemptions6 may allow the total number to be higher than 66,000 in a given fiscal year.) This is a limitation inherent in H-2B data because DOS does not publish any data on the employers who received H-2B visas, the occupations of the H-2B workers, or the wages employers have promised to pay the H-2B workers issued visas by DOS. H-2B data from approved USCIS H-2B petitions that are disaggregated by Standard Occupational Classification code (SOC) and listing wages promised to be paid to H-2B workers would not be as reliable as DOS visa data, but would be preferable to DOL labor certification data because they would reveal a narrower subset of employers likely to eventually get an H-2B visa. Unfortunately, USCIS does not publish those data either. USCIS only publishes the total number of H-2B petitions it has approved, along with other limited information found in a report to Congress that it is required by law to publish every year (USCIS 2015). The total number of H-2B petitions USCIS approved for fiscal years 2009 to 2013 was also published in a March 2015 report by the United States Government Accountability Office (GAO 2015, 21). The same GAO report criticized USCIS’s data collection, noting that while DOL uses modern SOC codes for classifying H-2B occupations, USCIS then converts those 840 occupations used by DOL to a different classification system that has a much smaller and broader subset of 83 detailed occupations (GAO 2015, 22). Data on wages to be paid by H-2B employers are collected by USCIS on the Form I-129 petition, but because they are not stored in electronic format (the data are stored in paper files), they are inaccessible to the government’s own auditors, or to the public, even with the use of a Freedom of Information Act request. As a result, DOL labor certification data are the most accurate and reliable public source of information for examining the occupations, work locations, and wages of H-2B workers. The H-2B data used in this report exclude all H-2B labor certification records labeled as “denied,” “certification expired,” and “partial certification expired,” because denied and expired records were not likely to become approved USCIS H-2B petitions or visas issued by the State Department. As a result, there may be a discrepancy between the total number of H-2B certifications listed in this report for fiscal 2012, 2013, and 2014 and the total number of certifications found in the raw data sets published by DOL online, as well as on DOL’s annual “Selected Statistics” fact sheets,7 which report all certification records, including those listed as expired. This may also result in lower totals by occupation in this report than are reported by DOL in the Selected Statistics fact sheets. When calculating occupational unemployment rates, the SOC codes do not correspond perfectly with the occupational codes used in the Current Population Survey (CPS) monthly household survey microdata, published jointly by the U.S. Census and the Bureau of Labor Statistics. CPS microdata are needed to calculate the unemployment rates for the top H-2B occupations. However, the H-2B occupations with the 15 largest numbers of certifications in fiscal 2014 match up reasonably well with the same or similar occupations found in the CPS data using the government’s crosswalks between the occupations, even though the occupational titles may differ slightly. Table 1 shows the 15 occupations with the largest number of approved labor certifications for H-2B workers in fiscal 2014, for the entire United States. The top 15 occupations account for 67,978 labor certifications out of 83,843 total certifications, 81 percent of all labor certifications in fiscal 2014. The largest occupation by far is Landscaping and Groundskeeping Workers, with 34,159 workers certified, making up 40.7 percent of all H-2B labor certifications in fiscal 2014. The second largest occupation is Forest and Conservation Workers, with 6,753 certifications (8 percent of the total). Together, the top two H-2B occupations accounted for nearly half of all H-2B certifications (48.8 percent). The third and fourth largest H-2B occupations were Maids and Housekeeping Cleaners and Amusement and Recreation Attendants, each of which accounted for approximately 6 percent of all H-2B certifications. The fifth-largest H-2B occupation, Meat, Poultry, and Fish Cutters and Trimmers, made up 3.5 percent of all H-2B certifications and the sixth-largest, Construction Laborers, accounted for 2.9 percent. 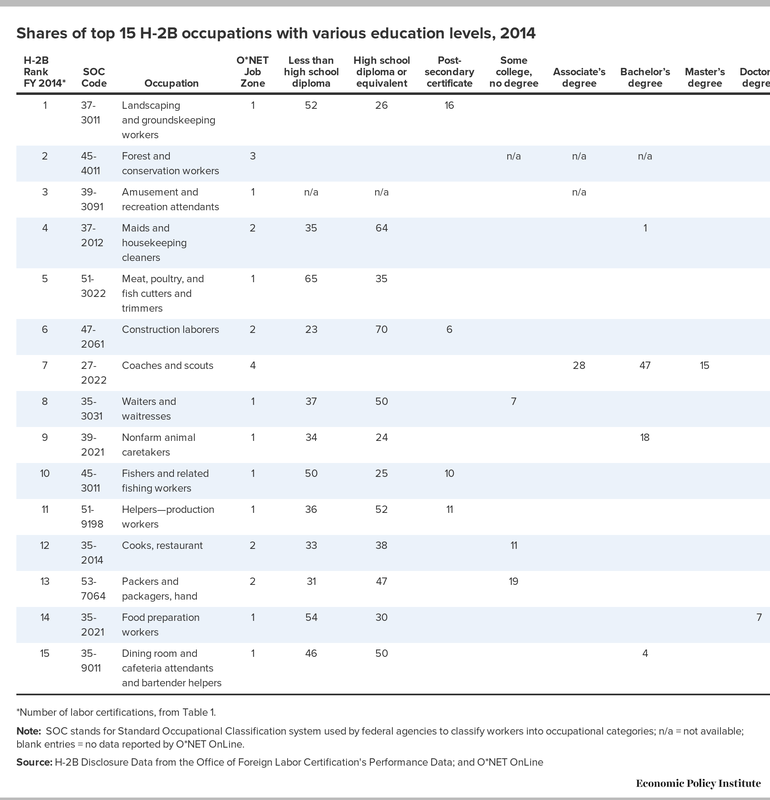 The rest of the top 15 H-2B occupations in fiscal 2014 are listed in Table 1. In 2013, 27.5 percent of all workers in the United States were earning “poverty-level” wages; this share has increased by 2.4 percentage points since 2000 (EPI 2013).9 From 2000 to 2012, the bottom 60 percent of wage earners in the United States on average experienced negative or zero real wage growth (Shierholz and Mishel 2013), and from 2000 to 2014, the median income for non-elderly households fell 12.3 percent (Mishel and Davis 2015). Even the most educated workers have not seen their wages rise since 2007; in fact, workers at all education levels have experienced stagnant or declining wages since 2007 (Gould 2015). Despite these dire statistics, low-wage occupations have been growing faster than middle-income or high-paying occupations since the end of the financial crisis of 2007–2009 (the “Great Recession”). According to the National Employment Law Project, low-wage occupations “constituted 21 percent of recession losses, but 58 percent of recovery growth” (NELP 2012). Many of the occupations that experienced high employment growth in 2014 (from BLS 2015a, Table 1.4), as well as the occupations projected to be the “fastest growing” between 2014 and 2024 (from BLS 2015b, Table 1.3) are in low-wage occupations that require little or no postsecondary education. While low-wage-earning workers in lower-skilled occupations in the United States are a significant share of the workforce and are in many cases employed in rapidly growing occupations, most have seen their wages stagnate or decline for many years. Of the 15 top H-2B occupations, nine are in O*NET Job Zone 1 (60 percent), four are in Zone 2 (26.6 percent), one is in Zone 3, and one is in Zone 4 (Table 2). According to O*NET, Job Zone 1 occupations “may require a high school diploma or GED certificate” and have employees who need “little or no previous work-related skill, knowledge, or experience” and “anywhere from a few days to a few months of training.” Job Zone 2 occupations “usually require a high school diploma” and have employees who usually need “[s]ome previous work-related skill, knowledge, or experience” and “anywhere from a few months to one year of working with experienced employees.” The O*NET survey data on the education levels of all workers who are employed in the United States in the top 15 H-2B occupations show that the vast majority either possess a high school diploma or its equivalent (but no additional education), or have less than a high school diploma. Therefore, because 13 of the top 15 H-2B occupations require little education and training, it can safely be said that they are lower-skilled occupations. The two possible exceptions are: Coaches and Scouts, in which over a quarter (28 percent) of workers reported possessing an associate’s degree, nearly half (47 percent) possess a bachelor’s degree, and 15 percent possess a master’s degree. The other is Nonfarm Animal Caretakers, in which 18 percent of workers reported possessing a bachelor’s degree. However, a worker may have a bachelor’s or master’s degree even though the job the worker performs requires little or no education. For example, many jobs in these two occupations, such as grooming horses at a stable (Nonfarm Animal Caretakers) or coaching a community college softball team (Coaches and Scouts), are unlikely to require a bachelor’s or master’s degree in any field. *Number of labor certifications, from Table 1. Note: SOC stands for Standard Occupational Classification system used by federal agencies to classify workers into occupational categories; n/a = not available; blank entries = no data reported by O*NET OnLine. U.S. DOL's Occupational Information Network (O*NET) slots occupations into zones depending on the educational and training needs of the occupation; the higher the zone number, the greater the need. For H-2B rankings, data set excludes records from original labeled "certification expired" and "partial certification expired" because expired records were not likely to become approved USCIS H-2B petitions or visas issued by the State Department. Table 3 shows the U.S. employment levels in 2004 to 2014 for all occupations and for the top 15 H-2B occupations (by Standard Occupational Classification) in fiscal 2014. 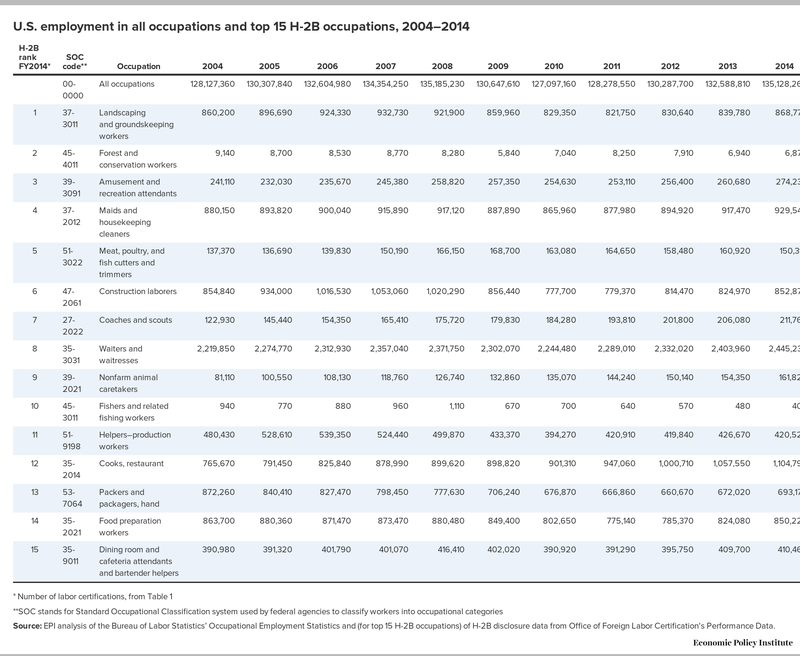 Table 4 shows the change in employment from 2004 to 2014 for all occupations in the United States, and for all workers in the United States who were employed in the occupations making up the top 15 H-2B occupations in FY 2014. Source: EPI analysis of the Bureau of Labor Statistics’ Occupational Employment Statistics and (for top 15 H-2B occupations) of H-2B disclosure data from Office of Foreign Labor Certification's Performance Data. 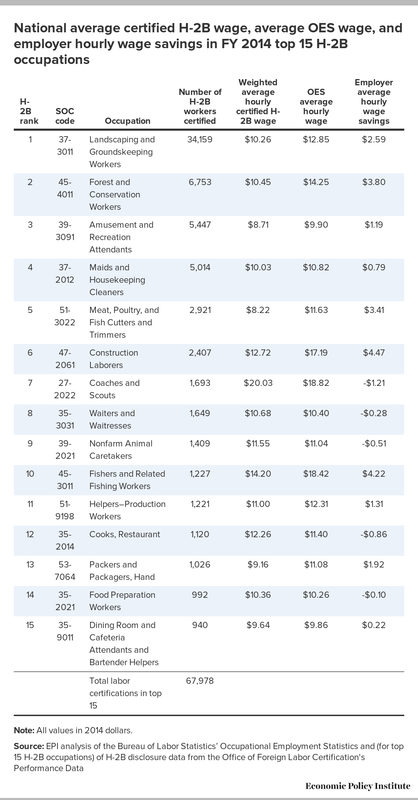 Table 5 shows the change in hourly wages for all workers in the United States and workers in the top 15 H-2B occupations from 2004 to 2014, adjusted to 2014 dollars. As the table shows, there was no significant wage growth for workers; wages were stagnant (growing less than 1 percent annually) or declined for workers in all of the top 15 H-2B occupations between 2004 and 2014. Are there labor shortages at the national level among the top 15 H-2B occupations? The claim by the Essential Worker Immigration Coalition that it is “concerned with the shortage of both semi-skilled and unskilled (‘essential worker’) labor” begs the question of whether there is any evidence that semiskilled and unskilled labor are in short supply. And since EWIC and other employer groups look to the H-2B visa as the remedy for labor shortages, it is reasonable to think about this in the context of the top H-2B occupations. However, it should be noted at the outset that determining whether a labor shortage exists in a particular occupation can be a difficult and inexact science. Numerous books and articles have been written on how to determine the existence of a shortage.13 While the definitions vary, the governments of various developed countries maintain and regularly update shortage occupation lists based on quantitative and qualitative labor market data and analysis.14 They rely on these analyses when crafting legislation and policy related to the workforce, the labor market, and immigration. A detailed explanation of how to conduct a labor shortage analysis is beyond the scope of this report. As mentioned, a substantial body of literature already exists on the subject, and in fact, this report will not conduct a detailed shortage analysis or make a determination about the existence of shortages in H-2B occupations. Exact methodologies for determining labor shortages may vary, and a discussion about their relative efficacy is also beyond the scope of this report. There are, however, basic definitions that many labor market economists can agree on. A good example is the simple definition offered by economists Philip Martin from the University of California, Davis, and Martin Ruhs from Oxford University, who have summarized the three essential elements required to establish a shortage (Martin and Ruhs 2011). Martin and Ruhs assert that industries and occupations reporting labor shortages should have (1) rising real wages relative to other occupations, (2) faster-than-average employment growth, and (3) relatively low and declining unemployment rates.15 The preceding sections of this report provide the available evidence relating to these three factors. Real wages are rising in only three of the top 15 H-2B occupations, and this rise is not significant. According to OES data, wages across all occupations stagnated in the United States between 2004 and 2014, rising only $0.40 in real terms (2014 dollars), 1.8 percent for all occupations. And as Table 5 shows, the story was mostly similar or worse in the top 15 H-2B occupations, where wages declined in real terms in 10 of the top 15 occupations. While wages increased in real terms in five of the top 15 occupations, the increases were insignificant: less than $1 in all cases, and less than a nickel in two of the occupations. In three occupations (Waiters and Waitresses, Fishers and Related Fishing Workers, and Dining Room and Cafeteria Attendants and Bartender Helpers) wages did rise faster than they did for all occupations, but rose at far less than even 1 percent per year. There is faster-than-average employment growth in less than half of the occupations. As Tables 3 and 4 show, from 2004 to 2014, seven of the top 15 occupations experienced employment growth that exceeded the 5.5 percent increase for all occupations, six experienced declines; and two experienced growth lower than the rate for all occupations. Three occupations experienced employment growth far exceeding the overall growth of 5.5 percent for all occupations from 2004 to 2014: Nonfarm Animal Caretakers (99.5 percent), Coaches and Scouts (72.3 percent), and Cooks, Restaurant (44.3 percent); however, wages in these three fastest-growing occupations declined over the same 10-year period. Rather than declining, unemployment rates increased in all but one of the top 15 H-2B occupations between 2004–2005 and 2013–2014, and all averaged very high unemployment rates in 2013–2014. The unemployment rate declined in one occupation, Helpers-Production Workers, which had an average unemployment rate of 10.8 percent during 2004–2005 and 10.3 percent during 2013–2014. Although the unemployment rate in this occupation declined by half a percentage point between 2004–2005 and 2013–2014, the unemployment rate remained very high in 2013–2014. In 11 of the top 15 H-2B occupations, the unemployment rate dropped from 2004–2005 to 2006–2007, but then rose significantly between 2006–2007 and 2013–2014. Such high unemployment rates suggest a loose labor market—an oversupply of workers rather than an undersupply—in the top 15 H-2B occupations. The unemployment rates presented in this report may underestimate how many workers cannot find work in the occupation because the official rates do not count workers who are no longer actively seeking employment in the occupation (either because they found a job in another occupation or because they gave up looking for work in the occupation). Two additional issues deserve to be explored in depth. Are the wage rates that employers are required to pay H-2B workers high enough to attract U.S. workers and comply with the Immigration and Nationality Act’s statutory requirement that an H-2B worker not be hired unless “unemployed persons capable of performing such service or labor cannot be found in this country”?16 And are the prevailing wage regulations promulgated by the U.S. Departments of Labor and Homeland Security adequate to prevent downward pressure on the wages of U.S. workers who are employed in the top H-2B occupations? This section reviews the average wages certified nationwide in the top 15 H-2B occupations in fiscal years 2012, 2013, and 2014, and compares them with the average wages nationwide for each occupation, as well with the average wage in each state where an H-2B job was certified. The difference between the H-2B certified wage and the average national or state wage in most cases represents how much employers can save on their wage bill, on average, by hiring an H-2B worker instead of a U.S. worker. Since 2010, the rules governing the legally defined “prevailing wage” that employers are required to pay H-2B workers (corresponding to occupation and local area) have been modified several times by the departments of Labor and Homeland Security, and have been the subject of litigation and congressional appropriations riders. As a result, different sets of prevailing wage regulations were in place during fiscal years 2012, 2013, and 2014. This section explains the different prevailing wage rules in the different fiscal years, and explores how they may have affected the results. Finally, the impact of employer-submitted private wage surveys (i.e., wage surveys that were not conducted by the U.S. Department of Labor) on determining H-2B prevailing wages is also assessed. Footnote 6: The 2008 rule required that when the prevailing wage was based on the OES, it should reflect skill levels. The agency’s implementing guidance required that the prevailing wage contain four wage tiers based on skill level. As a result, we refer throughout this rule to the 2008 rule’s requirement of four wage tiers. Because the OES survey captures no information about actual skills or responsibilities of the workers whose wages are being reported, the four-tiered wage structure, adapted from the statutorily required four tiers applicable to the H-1B visa program under section 212(p)(4) of the INA, 8 U.S.C. 1182(p), was derived by mathematical formula as follows to reflect “entry level,” “qualified,” “experienced,” and “fully competent” workers: Level 1 is the mean of the lowest-paid 1/3, or approximately the 17th percentile; Level 2 is approximately the 34th percentile; Level 3 is approximately the 50th percentile; and Level 4 is the mean of the highest-paid 2/3, or approximately the 67th percentile. In addition, wage methodology guidance published by the Employment and Training Administration (ETA) at DOL in 2009 provided “policy and procedural guidance” for private wage surveys submitted by employers for H-2B prevailing wage determinations (ETA 2009). On January 19, 2011, the Obama administration issued a final rule to modify the 2008 H-2B wage methodology and 2009 wage guidance that would have set the H-2B prevailing wage “as the highest of the OES arithmetic mean wage for each occupational category in the area of intended employment; the applicable SCA/DBA wage rate; or the CBA wage” and “eliminated the use of employer-provided surveys as alternative wage sources, except in limited circumstances.” (DHS and DOL 2015, 24148) (The limited circumstances included in which the H-2B job was not represented in the DBA, SCA, or OES, and the surveys submitted had to meet the methodological standards in the 2008 rule.) However, due to legal challenges in federal court, the administration postponed implementation of the 2011 final wage rule (DOL 2011a), and was also prevented by Congress from using any funds to implement, administer, or enforce the January 2011 wage rule as a result of enacted appropriations legislation (DOL 2011b).17 As a result, the four-tiered 2008 wage methodology remained in effect, and the use of of private wage surveys under the terms of the 2008 wage rule and 2009 wage guidance continued to be permitted throughout all of fiscal 2012. 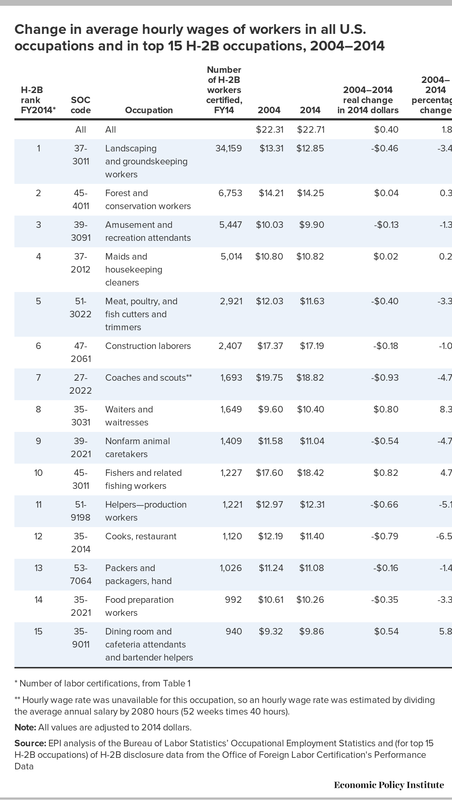 Table 6 shows the top 15 H-2B occupations in fiscal 2012, and the nationwide average hourly wage for certified H-2B workers in each of the occupations. 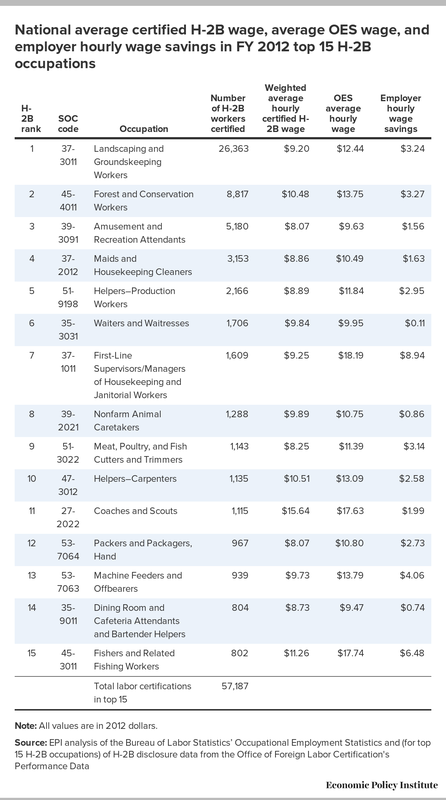 The 2012 OES average hourly wage for all workers in the occupation nationwide is listed next to the H-2B wage. In tables 6 through 11, the final column shows the difference between the average hourly certified H-2B wage and the average hourly OES wage (nationwide or by state); this is what employers save, on average, by hiring an H-2B worker instead of a worker who is paid the average (national or state) wage for the occupation. A negative value in the employer hourly wage savings column represents an H-2B job that was, on average, certified at a higher wage rate than the corresponding OES national or state average hourly wage. Note: All values are in 2012 dollars. SOC stands for Standard Occupational Classification system used by federal agencies to classify workers into occupational categories. Table 6 shows that in each of the top 15 H-2B occupations in fiscal 2012, the average hourly wage certified nationwide for H-2B workers was lower than the OES average hourly wage for all workers in the occupation. The biggest wage savings for employers was found in the First-Line Supervisors/Managers of Housekeeping and Janitorial Workers occupation; employers could save nearly $9 per hour on average by hiring an H-2B worker instead of a worker earning the national average for the occupation. In the top two occupations of Landscaping and Groundskeeping Workers and Forest and Conservation Workers, the average hourly savings were over $3. If for example, an employer hired an H-2B landscaper to work for 40 hours per week for nine months (approximately 36 weeks) at $3 per hour less than the local average wage, the employer would save $4,320. The results are similar when the average wages in each state and for each occupation for which data are available are compared with the average certified H-2B wage for the corresponding state and occupation. Table 7 (which can be found at the end of this report) shows that in the vast majority of cases, H-2B workers on average were certified to be paid lower wages than the state average. In 27 instances (representing a total of 675 workers), the average certified H-2B wage was higher than the state OES average wage for the occupation. Although the April 24, 2013, IFR required employers to pay the “arithmetic mean,” meaning the average hourly wage (which is in most cases identical to the Level 3 wage), and no longer permitted employers to pay their H-2B workers the 17th (Level 1) or 34th (Level 2) percentile wages, the 2013 IFR continued to permit the use of private wage surveys submitted by employers to set prevailing wage levels under the terms of the 2008 wage rule and 2009 wage guidance; something that the final 2011 wage methodology regulation was much more restrictive about permitting (but which never became effective). In a 2014 case, the United States Court of Appeals for the Third Circuit considered the legality and continued use of private wage surveys, and noted that “DOL allowed this unlimited use of private surveys despite its 2011 findings that such surveys are unreliable and should only be used in extraordinary circumstances.”18 The wage methodology that employers were required to use from April 24, 2013, through the rest of the fiscal year (ending on September 30, 2013) was the wage methodology promulgated in the 2013 IFR (the arithmetic mean by occupation and local area) along with DOL-accepted private wage surveys under the terms of the 2008 wage rule and 2009 wage guidance. Table 8 shows the top 15 H-2B occupations in fiscal 2013, and the nationwide average hourly wage for certified H-2B workers in each of the occupations. As with Table 6, the final column shows the difference between the average hourly certified H-2B wage and the OES average hourly wage for all workers in the occupation; in other words what employers save, on average, by hiring an H-2B worker who is paid the certified wage instead of a U.S. worker who is paid the average wage for the occupation. Note: All values are in 2013 dollars. Table 8 shows that in 14 of the top 15 H-2B occupations in fiscal 2013, the average hourly wage certified for H-2B workers was lower than the OES nationwide average hourly wage for the occupation. The biggest savings was in the Construction Laborers occupation; employers could save $6.39 per hour on average by hiring an H-2B worker instead of a worker earning the national average for the occupation. In the top two occupations, the average hourly wage savings were again over $3. The only occupation where on average, the certified hourly H-2B wage was higher than the national OES average hourly wage was Cooks, Restaurant, where the average certified H-2B wage was $0.31 an hour higher. The results are similar when comparing the average wages in each state and for each occupation for which data are available with the average certified H-2B wage for the corresponding state and occupation in fiscal 2013. Table 9 (which can be found at the end of this report) shows that in the vast majority of cases, H-2B workers on average were certified to be paid lower wages than the state average. In 34 instances representing a total of 2,403 workers, the average certified H-2B wage was higher than the state OES average wage for the occupation. While 2,403 H-2B certifications is still a very small share of all the labor certifications in the top 15 for fiscal 2013—accounting for only 3.5 percent of certifications in the top 15—it represents a larger share than in fiscal 2012, when only 1.2 percent of H-2B certifications in the top 15 were in occupations in a state where the average certified H-2B wage was higher than the state OES average wage for the occupation. On October 1, 2013, at the beginning of fiscal 2014, the prevailing wage rule laid out in the 2013 DHS/DOL Interim Final Rule (IFR) had been effective for just over five months. Therefore, during the entirety of fiscal 2014, employers were required to follow the wage methodology in the April 24, 2013, IFR, along with DOL-accepted private wage surveys under the terms of the 2008 wage rule and 2009 wage guidance. This allows us to compare a full year of H-2B wage data under the 2013 IFR wage rule and private wage surveys with the OES average wages for the top 15 H-2B occupations. The most obvious shift in the fiscal 2014 data displayed in Table 10 is that one-third of the top 15 H-2B occupations were on average, certified at an hourly wage that was higher than the national OES average hourly wage for the occupation, compared with only one occupation in fiscal 2013 and zero occupations in fiscal 2012. It is possible that the 2013 IFR requiring that employers pay the local OES average wage (unless a collective bargaining agreement existed for the job or if an alternative wage survey was accepted by DOL) may have raised average certified H-2B wages enough for this to occur. However, if employers were in fact paying the local average wage to their H-2B workers after implementation of the 2013 IFR, one could reasonably expect that the significant wage savings employers get by hiring an H-2B worker instead of a U.S. worker earning the local average wage would mostly disappear. But hourly wages for H-2B Landscaping and Groundskeeping workers—the largest H-2B occupation, accounting for over a third of all H-2B jobs certified in fiscal 2014—were on average certified at a much lower hourly wage than the national OES average hourly wage for the occupation: $2.59 less. That means employers still saved significantly on their wage bills by hiring H-2B landscapers instead of local workers earning the local average wage. 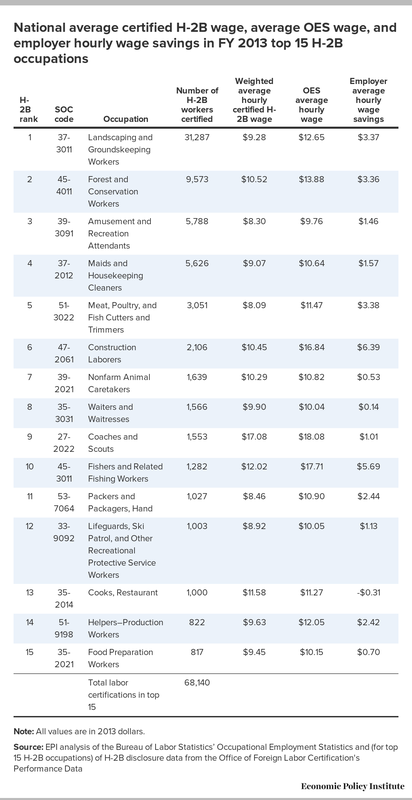 Employers hiring H-2B workers for other jobs in the top six, such as in seafood processing (as part of the Meat, Poultry, and Fish Cutters and Trimmers occupation), construction (Construction Laborers), and working for traveling fairs and carnivals (Amusement and Recreation Attendants), also saw significant wage savings despite the 2013 IFR requiring that H-2B workers be paid the local average wage. In the 12 months leading up to the March 2013 CATA decision striking down the 2008 H-2B wage rule, employers seeking labor certification for H-2B visas submitted a total of 49 applications using private surveys to determine the prevailing wage, the court said. By contrast, employers submitted 1,559 applications using private surveys in the nine months between July 1, 2013, and March 31, 2014—a 3,182 percent increase. According to the court, 21.1 percent of those prevailing wage determinations certified wages less than the average wage for the lowest skill level on the OES survey, and 94.4 percent of the determinations included wages lower than the OES’s Level II. The results by state and occupation for fiscal 2014 are similar to the two previous years’ differences between the average certified H-2B wage and the average OES wage for the occupation in the state. Table 11 (which can be found at the end of this report) shows that in the vast majority of cases, again H-2B workers on average were certified to be paid lower wages than the state average. However, in fiscal 2014, the share of top 15 H-2B workers whose certified H-2B wage was higher than the state OES average wage for the occupation was greater than in fiscal 2012 or fiscal 2013. In fiscal 2014 there were 86 instances in which the H-2B average hourly wage was certified at a higher average hourly wage than the state OES wage for a particular occupation in a state. These instances represented 6,145 workers out of a total of 67,978 H-2B labor certifications in the top 15 occupations, or 9 percent. Because the 2015 wage rule was published relatively recently, it will be difficult to assess the impact of the rule in the same comparative manner used in this report until future years of H-2B data are published. The 2015 wage rule has some obvious flaws, however, which could lead to results similar to past years when H-2B wages were mostly certified at below-average wages. The 2015 rule continues to allow paying H-2B workers an hourly wage rate that is lower than the local OES average if a CBA applies, and the 2015 rule still permits the use of non-OES wage surveys. While 20 C.F.R. 655.10(f) restricts which non-OES surveys may be used to establish an H-2B prevailing wage, still permitted are surveys “conducted and issued by a state, including any state agency, state college, or state university.” Employers and employer groups might respond by requesting that state agencies and/or universities conduct new wage surveys in certain regions and occupations, and may even fund such surveys—and therefore perhaps exert undue influence on the results—since nothing in the H-2B regulations prohibits requesting that a wage survey be conducted by a public agency or a university and then privately funding it. As a result, employers will likely be permitted to use private wage surveys in a much broader range of circumstances, and this may result in H-2B workers being paid wages that are below the OES local average wage for their jobs. As of the time of publishing this report, the DOL has only given a preliminary indication of how it will interpret, implement, and enforce some of the December 2015 amendments to the H-2B program in the Consolidated Appropriations Act of 2016 (DOL 2016). DOL has not, however, explained in detail how it will implement the provisions relating to private wage surveys. DOL has also not yet indicated whether it will publish new regulations to implement these changes, either as an interim final rule or as a regulation that is subject to notice and comment procedures under the Administrative Procedure Act. H-2B wage levels in fiscal 2016 will depend much on DOL’s interpretations and actions, and any possible litigation that results. One of the other notable changes to the H-2B program in the Consolidated Appropriations Act of 2016 is found in Section 565, commonly referred to as the “returning worker exemption,” which exempts foreign workers who participated in the H-2B program in fiscal 2013, 2014, or 2015 from being counted under the program’s annual numerical limitation of 66,000. This could lead to a large increase in the number of H-2B workers in the United States; as a result of the returning worker exemption, the size of the H-2B program could as much as quadruple. However, previous years in which the returning worker exemption was the law of the land suggest the number of H-2B workers is more likely to double or triple, but ultimately will depend on employer demand. In fiscal 2007 for example, the last year the returning worker exemption was in place, nearly 130,000 H-2B visas were issued (Bruno 2015). In addition, DOL has been prohibited in fiscal 2016 from using appropriated funds to enforce H-2B regulations that require “employers of H-2B workers to provide at least the same wages and other working conditions as they provide to H-2B workers to certain U.S. workers performing substantially the same work identified in the labor certification or performed by the H-2B workers,” or to enforce the rule requiring employers “to offer workers full-time employment for a total number of work hours equal to at least three-fourths of the workdays of each 12-week period (or 6-week period if the employment covered by the job order is less than 120 days)” (DOL 2016). While DOL cannot enforce these rules during fiscal 2016, the substantive rules remain in place even in fiscal 2016. The Consolidated Appropriations Act of 2016 also prevents DOL from using funds to audit H-2B applications or to conduct assisted or supervised recruitment (i.e., where DOL helps employers search for willing and available U.S. workers). Most of the December 2015 amendments to the H-2B program, including the amendment to the 2015 wage rule, will remain in place for all of fiscal 2016. If no further amendments are made through standalone legislation or appropriations legislation to fund the U.S. government in fiscal 2017, the original 2015 wage rule (as promulgated in April 2015) would become effective again at the beginning of fiscal 2017 and the restrictions on using appropriated funds to enforce the rule would expire. The evidence presented here—flat wages and persistent high unemployment rates in the top 15 H-2B occupations for the past decade—sheds doubt on claims that there are labor shortages in the top 15 H-2B occupations. Members of Congress and the federal agencies tasked with administering the H-2B temporary foreign worker program should take these data points into consideration when employer groups and other corporate representatives urge them to modify the H-2B wage methodology or rules relating to the recruitment of U.S. workers. One sensible policy response could be to reform the H-2B program so that the availability of work visas is tied to occupations and regions that are experiencing proven and documented labor shortages; but that would also require that an entity of the U.S. government be tasked with assessing and declaring labor shortages, and perhaps publishing and continually updating shortage occupation lists, according to a selected methodology. The increase in the share of H-2B wages that were on average certified at a wage higher than the state or national OES average wage from fiscal 2012 to fiscal 2014 suggests that the prevailing wage rules put in place in the middle of fiscal 2013 (by the 2013 DHS/DOL Interim Final Rule) may have put some limited upward pressure on H-2B wages. To recap, the 2013 IFR requires employers to pay the local average wage unless a collective bargaining agreement is applicable, or if the U.S. Department of Labor approves the use of a wage survey that it did not conduct. The intention of the 2013 Interim Final Rule was indeed to prohibit employers from continuing to pay their H-2B workers wages that were much lower than the average being paid to local U.S. workers in the same occupations. However, the use of private wage surveys by employers to determine H-2B prevailing wages in the 2013 IFR—which continued to use the 2008 wage rule and 2009 wage guidance on private wage surveys—has prevented certified H-2B wages from closing the gap with the average wages paid to other similarly situated workers in the United States. The 2015 H-2B Final Wage Rule continues to permit wage surveys that were not conducted by the U.S. Department of Labor in some circumstances; and whether employers will continue to be allowed to underpay their H-2B employees vis-à-vis U.S. wage standards will depend on how the 2015 Final Wage Rule is implemented by the U.S. Department of Labor, if and when it becomes effective. In fiscal 2016, it is all but certain that the likely increased use of private wage surveys to set H-2B wages as a result of the December 2015 appropriations riders will lower the wages paid to H-2B worker to levels far below the local averages paid to similarly situated U.S. workers. In addition to the December 2015 appropriations riders which became law, multiple legislative proposals were introduced in Congress in late 2015 (Lipinski 2015b) that would reform the H-2B program. Specifically the proposals would permanently reinstitute the use of private wage surveys and the four prevailing wage skill levels for determining H-2B wages that were introduced in the 2008 wage rule and 2009 wage guidance. If such legislative proposals or additional appropriations riders were enacted, they would likely ensure that the temporary foreign workers employed through the H-2B program will continue to be underpaid for the foreseeable future, which would continue to put downward pressure on the wages of similarly situated U.S. workers employed in the top H-2B occupations. The author is grateful to Arthur Read, David Griffith, Ross Eisenbrey, and Meredith Stewart for the insightful comments and observations they provided during the drafting of this document. The author is also grateful for the valuable research assistance provided by Will Kimball and Tanyell Cooke. However, the author is solely responsible for any errors or omissions. 1. The 2015 wage rule (along with numerous other H-2B reforms) was published by DHS and DOL in April 2015 and was able to come into effect (was not postponed by litigation or appropriations legislation). However, in December 2015, Congress made changes to these rules through riders to omnibus appropriations legislation, as discussed at the end of this paper. 2. See Title III—Essential Worker Visa Program, Secure America and Orderly Immigration Act, S.1033, 109th Cong. (2005–2006). 3. For a detailed listing of the elements of the W-1 visa program in S. 744, see Costa (2013). 6. H-2B workers who have their H-2B visas extended for longer than the original validity period will not be counted again against the H-2B annual cap. Also, fish roe processors, fish roe technicians, and supervisors of fish roe processing are exempt from the annual cap (see Pub. L. No. 108-287, § 14006, 118 Stat. 951, 1014 (2004)), and from November 28, 2009, until December 31, 2019, workers performing temporary labor or services in the Commonwealth of the Northern Mariana Islands (CNMI) or Guam are also exempt from the annual cap (see 48 U.S.C. § 1806(a)(2) as amended by sec. 10 of Pub. L. 113-235; 48 U.S.C. § 1806(b)). 7. See e.g., OFLC (2015b). 8. The one notable exception where OES data may be lacking is in the second-largest H-2B occupation, Forest and Conservation Workers, (SOC code 45-4011). In recent New Jersey District Court litigation in Comité de Apoyo a Los Trabajadores Agricolas (CATA) v. Perez case (1:15-cv-04014-RBK-JS Doc. 21-3, filed July 15, 2015, and see also Docs. 1-2 and 21-2), the plaintiffs argue that the Bureau of Labor Statistics did not sample critical industries employing H-2B workers in SOC code 45‐4011, and therefore, the OES wages reported do not calculate a valid average wage rate for workers in 11 states in which prevailing wage determinations are made for workers employed in SOC 45-4011. Specifically, plaintiffs note that excluded from the OES survey “are almost all of the industries that hire 96% of H-2B forestry workers, including: North American Industry Classification System (NAICS) 1131 (Timber Tract Operations); NAICS 1132 (Forest Nurseries and Gather of Forest Products); NAIS 114 (Fishing, Hunting and Trapping); and NAICS 1154 (Support activities for Forestry). The exclusion of the industries that employ most forestry workers calls into question the validity of the OES forestry wage even in those states where one is reported.” Plaintiffs argue that Service Contract Act (SCA) wage rates are more appropriate for setting H-2B wage rates in forestry jobs because “The SCA survey…does not exclude the industries that hire H-2B forestry workers and, as a result, reports wages specific to H-2B forestry jobs in virtually all areas.” (CATA) v. Perez (Doc. 21-3, at 34). 9. The poverty-level wage in the figure cited is calculated using an estimate of the four-person weighted average poverty threshold in 2011 of $23,010 (based on the 2010 threshold updated for inflation). This is divided by 2,080 hours to obtain a poverty-level wage of $11.06 in 2011. The poverty-level wage is roughly equal to two-thirds of the median hourly wage. This figure is deflated by CPI-U-RS (Consumer Price Index Research Series Using Current Methods) to obtain the poverty-level wage levels for other years. The threshold is available at the U.S. Census Bureau website. 14. See e.g., the Australian Government’s Skilled Occupations List, and the UK government’s Tier 2 Shortage Occupation List. 15. It must be noted that the labor market data metrics used for determining whether a labor shortage exists can also be usefully supplemented with additional evidence. For example, when assessing whether a labor shortage exists, the United Kingdom’s Migration Advisory Committee (MAC) also interviews employers, workers, labor unions, and other stakeholders to get a more complete picture than can be gathered purely from national-level labor market statistics. (The MAC refers to these surveys as “bottom-up” evidence.) These qualitative data can be useful and round out the analysis when labor market data do not provide a clear-enough picture on their own (Martin and Ruhs 2011). Nevertheless, if unemployment rates in an occupation are exceptionally high and wages do not rise for a prolonged period of time, those two factors are strong evidence that a labor shortage does not exist. 16. Immigration and Nationality Act, § 101(a)(15)(H)(ii)(b) [8 U.S.C. §1101(a)(15)(H)(ii)(b)]. 17. Multiple appropriations bills that were enacted continued to prevent DOL from using funds to enforce the 2011 wage rule; see Consolidated and Further Continuing Appropriations Act, 2012, Pub. L. 112-55, 125 Stat. 552, Div. B, Title V § 546 (2011); Consolidated Appropriations Act, 2012, Pub. L. 112-74, 125 Stat. 786, Div. F, Title I § 110 (2011); Continuing Appropriations Resolution, 2013, H.J. Res. 117, 112th Cong., 126 Stat. 1313 (2012); Consolidated and Further Continuing Appropriations Act, 2013, Pub. L. 113-6, 127 Stat 198, Div. F, Title 5 (2013). 18. Comité de Apoyo a Los Trabajadores Agricolas (CATA) v. Perez, No. 14-3557, Doc. No. 003111811504 (3d Cir. Dec. 5, 2015), at 15. 19. For further discussion, see also Costa (2015). 20. Comité de Apoyo a Los Trabajadores Agricolas (CATA) v. Perez, No. 14-3557, Doc. No. 003111811504 (3d Cir. Dec. 5, 2015), at 36–37. 21. Comité de Apoyo a Los Trabajadores Agricolas (CATA) v. Perez, No. 14-3557, Doc. No. 003111811504 (3d Cir. Dec. 5, 2015), at 26–27 (footnotes omitted). 22. Consolidated Appropriations Act of 2016, H.R. 2029, 114th Cong., § 112 (2015). Pub. L. No. 114-113. Bureau of Labor Statistics (BLS) Occupational Employment Statistics (OES). 2015. May 2014 National Occupational Employment and Wage Estimates. Office of Foreign Labor Certification (OFLC) (U.S. Department of Labor). 2015a. OFLC Performance Data. O*NET OnLine. www.onetonline.org (accessed on July 8, 2015). Barnow, Burt, John Trutko, and Jaclyn Schede Piatak. 2013. Occupation Labor Shortages: Concepts, Causes, Consequences, and Cures. W.E. Upjohn Institute for Employment Research. Bruno, Andorra. 2015. The H-2B Visa and the Statutory Cap: In Brief. Congressional Research Service. December 11. Bureau of Consular Affairs (U.S. Department of State). 2015. Nonimmigrant Visa Statistics. Bureau of Labor Statistics (BLS) (U.S. Department of Labor). 2015a. Table 1.4: Occupations with the Most Job Growth, 2014 and projected 2024. Bureau of Labor Statistics (BLS) (U.S. Department of Labor). 2015b. 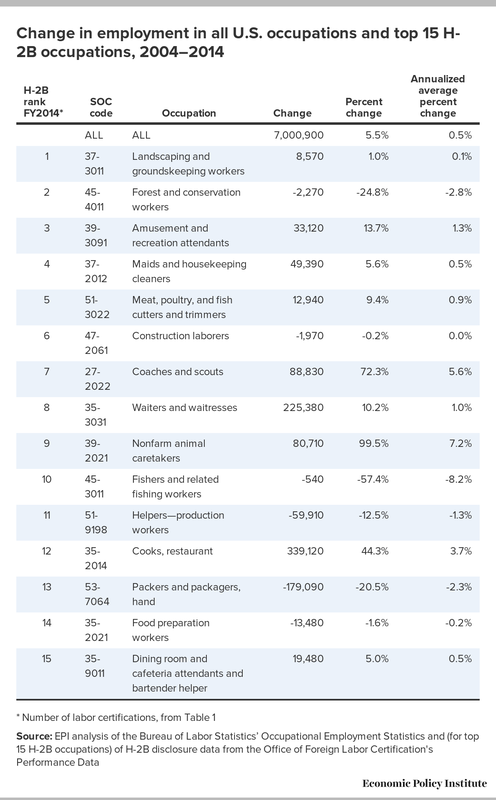 Table 1.3: Fastest Growing Occupations, 2014 and Projected 2024. Costa, Daniel. 2013. Future Flows and Worker Rights in S. 744: A Guide to How the Senate Immigration Bill Would Modify Current Law. Economic Policy Institute. November 12. Costa, Daniel. 2015. H-2B Wage Rule Loophole Lets Employers Exploit Migrant Workers. Economic Policy Institute. September 10. Department of Homeland Security (DHS) and Department of Labor (DOL). 2015. Wage Methodology for the Temporary Non-Agricultural Employment H–2B Program, Docket No. ETA–2013–0003], RIN 1205–AB69. 80 Fed. Reg. 24146. April 29. Department of Homeland Security (DHS) and Department of Labor (DOL). 2013. Wage Methodology for the Temporary Non-Agricultural Employment H–2B Program, Part 2, RIN 1205–AB69, 78 Fed. Reg. 24047. April 24. Department of Labor (DOL). 2011a. Wage Methodology for the Temporary Non-Agricultural Employment H–2B Program; Postponement of Effective Date, RIN 1205–AB61, 76 Fed. Reg. 59896. September 28. Department of Labor (DOL). 2011b. Wage Methodology for the Temporary Non-Agricultural Employment H–2B Program; Delay of Effective Date, RIN 1205–AB61, 76 Fed. Reg. 73508. November 29. Department of Labor (DOL) (Employment and Training Administration, Office of Foreign Labor Certification). 2016. Emergency Guidance: Implementation of 2016 DOL Appropriations Act. January 5. Downs, Anna. 2009. Identifying Shortage Occupations in the UK. Economic and Labour Market Review 3(5): 23–29. Economic Policy Institute (EPI). 2013. “Share of Workers Earning Poverty-level Wages, by Gender, 1973–2013.” The State of Working America. Employment and Training Administration (ETA) (U.S. Department of Labor. 2009. Prevailing Wage Determination Policy Guidance, Nonagricultural Immigration Programs. Revised November 2009. Essential Worker Immigration Coalition (EWIC). 2007. “Cut in Temporary Worker Program Weakens Immigration Reform.” May 24. Essential Worker Immigration Coalition (EWIC). 2015. Website home page accessed December, 2015. Francis, Laura. 2014. “DOL’s Use of Private Wage Surveys In H-2B Program Struck Down by 3rd Cir.” Bloomberg BNA. December 8. Gould, Elise. 2015. Even the Most Educated Workers Have Declining Wages. Economic Policy Institute. February 20. H-2B Workforce Coalition. 2015. “H-2B Workforce Coalition Applauds H-2B Provisions in End-of-Year Congressional Spending Legislation.” Website accessed December 16, 2015. Lipinski, Jed. 2015a. “Foreign Guest Workers to Triple under New Federal Budget Bill.” The Times-Picayune. December 21. Lipinski, Jed. 2015b. “Foreign Guest Worker Visas Targeted in Cassidy, Boustany Bills.” The Times-Picayune. November 11. Luban, Rachel. 2015. “DOL Freezes Guestworker Program After Court Ruling.” In These Times. March 17. Martin, Philip, and Martin Ruhs. 2011. Labor Shortages and U.S. Immigration Reform: Promises and Perils of an Independent Commission. International Migration Review, Volume 45, Issue 1 (174–187), Spring. Meier, Barry. 2015. “Union Accused of Betraying Migrant Carnival Workers.” New York Times. September 1. Mikulski, Sen. Barbara. 2015. “Mikulski Fights to Support Maryland’s Seafood Industry and Eastern Shore Jobs in FY16 Spending Bill.” Email from Matt Jorgenson on Behalf of Sen. Barbara Mikulski, Office of Senator Barbara Mikulski. On file with the author. December 16. Mishel, Lawrence, and Alyssa Davis. 2015. Income Stagnation in 2014 Shows the Economy Is Not Working for Most Families. Economic Policy Institute. September 16. Monger, Randall. 2013. Nonimmigrant Admissions to the United States: 2012, Annual Flow Report. Office of Immigration Statistics, Department of Homeland Security. August. National Employment Law Project (NELP). 2012. The Low-Wage Recovery and Growing Inequality. August. Parker, Ashley, and Steven Greenhouse. 2013. “Labor and Business Reach Deal on Immigration Issue.” New York Times. March 30. Office of Foreign Labor Certification (OFLC) (U.S. Department of Labor). 2015b. H-2B Temporary Non-Agricultural Labor Certification Program – Selected Statistics, FY 2014. Schmitt, John. 2012. Low-Wage Lessons. Center for Economic and Policy Research. January. Shierholz, Heidi, and Lawrence Mishel. 2013. A Decade of Flat Wages: The Key Barrier to Shared Prosperity and a Rising Middle Class. Economic Policy Institute. August 21. Silverleib, Alan. 2013. “Senate Passes Sweeping Immigration Bill.” CNN. June 28. Siskind, Greg. 2015. “Siskind Summary: Important Immigration Provisions Included in Omnibus Appropriations Bill.” Greg Siskind on Immigration Law and Policy (blog). December 22. United States Citizenship and Immigration Services (USCIS), U.S. Department of Homeland Security. 2015. H-2B Nonagricultural Temporary Worker Visa and Status, Fiscal Year 2014 Semiannual Report to Congress, Part 2: October 1, 2013 – September 30, 2014. February 11. United States Government Accountability Office (GAO). 2015. H-2A and H-2B Visa Programs: Increased Protections Needed for Foreign Workers. March. U.S. Chamber of Commerce (U.S. Chamber) and ImmigrationWorks USA. 2010. The Economic Impact of H-2B Workers. October 28. Note: All values are in 2014 dollars.